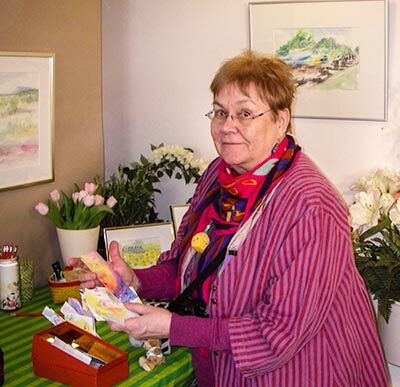 Here is a subdivision of our site presenting Margareta and her work as an artist, reports from the Sollentuna Art Shows in which she has participated, and also some general material about art and artists. It has its own set of navigation buttons above. After my studies at the Art School “Konstfack” in Stockholm I have worked as an illustrator of books and designer of graphic art, e.g. postcards, stationary and diplomas, also designing exhibitions with different themes in libraries. My production also includes a great number of aquarelles (water-colour paintings) especially from the south of Sweden and from travels in Tuscany and Spain. 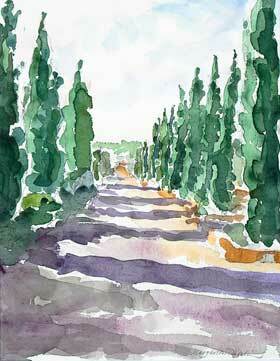 Movement in the art – I like to try catch the speed of the cyclists in Tour de France or La Vuelta España. I also work as a calligrapher. Sometimes I add some calligraphy in the aquarelles, a short poem or quotation to give the motive an extra poetic touch. Born 1941 in Umeå (Vännäs) in north Sweden, now living in Sollentuna, near Stockholm. Swedish University College of Arts, Crafts and Design “Konstfack” (Master of Drawing, and decorative painting).